Return shipping costs and 10% restocking fee. Lifetime Frame & Motor Warranty, 5-Year Parts Warranty, and 2-Year Labor Warranty. 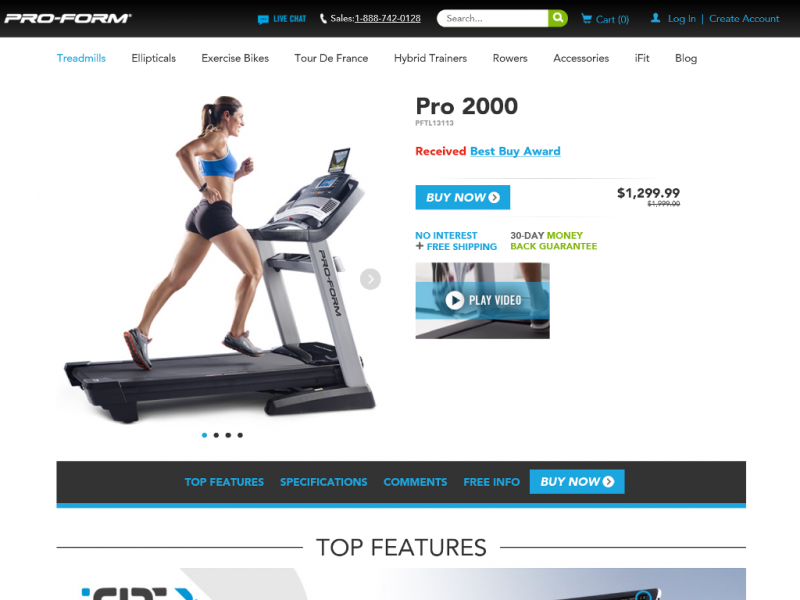 The Pro 2000 Treadmill is manufactured and sold by Pro-Form. It has received numerous best buy awards in part because of it's excellent price point at $1,299.99 and with the commercial like features it offers. 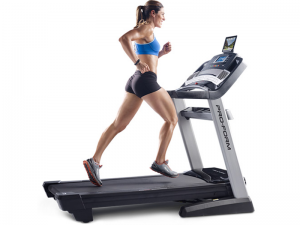 With this treadmill you get a durable and powerful motor that allows for heavy use, the ability to incline and decline the deck, a large display and iFit compatibility. With these features the Pro 2000 is ideal for your above average runner and beginners a like. The Pro 2000 has a footprint of 80" long by 39.5" wide, and 63" high. The running surface (deck) is 60" long by 22" wide and uses a commercial tread belt on 2.5" non-flex rollers. This treadmill also comes with the ProShox cushioning system which reduces the physical stress of running by cushioning joints from impacts. With the easy lift feature, folding this treadmill is simple and results in decreasing the length of the machine by over half. With the 3.5 hp commercial motor you can can walk or run at speeds anywhere from 1 to 12 mph at a push of a button. You can also automatically adjust the incline of the treadmill by up to 15% and decline to -3%. With the strong steel frame and motor the user weight capacity for the Pro 2000 is a maximum of 350 lbs. 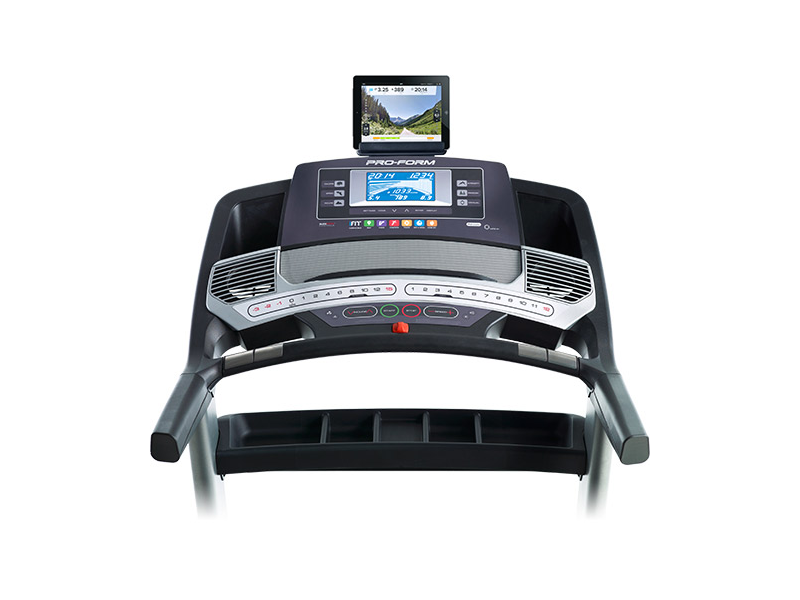 The console on the treadmill sports a 7" backlit LCD display that shows important information like your speed and calories burned in an easy to read format. The console also includes speakers and a music port for your iPod and MP3 music players. On either side of the console you also have a multi-speed fan to keep your workouts comfortable. With the treadmill you have access to 32 workout programs. An EKG dual grip heart rate sensors is built into the front hand rail and you have the option to use the included wireless chest strap. 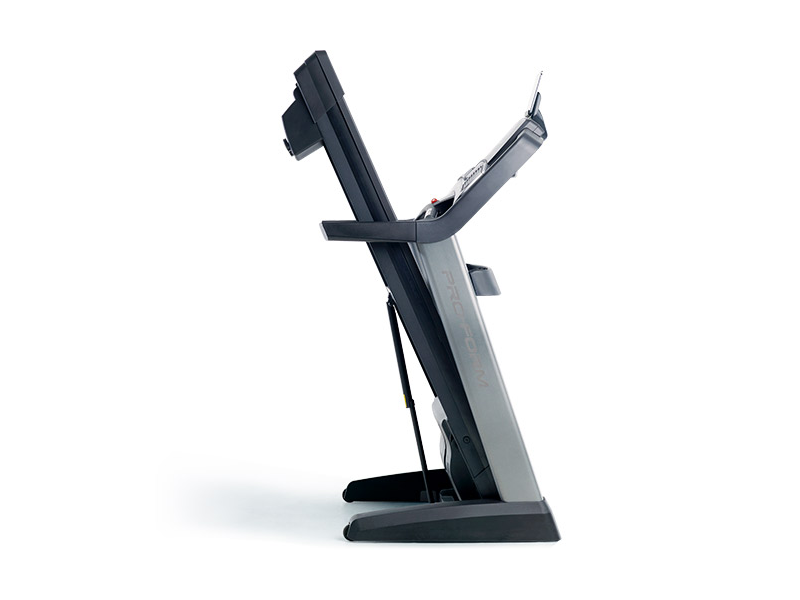 To start using the Pro 2000 you first need to step on the foot rails of the treadmill. You then attach the clip to your clothing and insert the safety key into the treadmill console. After a few moments the display will turn on and you can then either select a program or manual mode. Once your desired option is selected you then hit the start button (or speed increase button). The treadmill will start at 1 mph and then after a few moments continue to the speed of the first time segment of your program, or if you are in manual mode you can then select your desired speed. Programmed workouts are divided into equal time segments. Each time segment represents a certain speed and incline. While working out the current time segment you are in will flash on the display. If you change your speed or incline during a pre-programed workout program after the next time segment/interval the machine will reset the speed and incline to the preprogrammed levels. The treadmill will stop after the program is completed or if you press the stop button or pull on the safety key. The Pro 2000 comes with 32 workout programs designed by certified personal trainers to burn calories and simulate certain running conditions. These programs automatically change the speed and incline during your workout. These changes also depends on the level (intensity) you chose for the program along with what your heart rate is. You access workouts by pressing (one or more times) either the Calorie, Speed, Incline, or Intensity buttons, until your desired workout appears in the display. With the optional iFit module you can control the treadmill and track your fitness information with your smartphone or tablet using the iFit app. The app is able to control the speed and incline of the treadmill and includes an almost unlimited number of workout programs. Best yet you can use Google Maps to run real world routes and see what they look like with Google Street View while you are working out. With the Pro 2000 treadmill comes with free shipping (curb side only). Based on the cost of what other companies charge for shipping this is a savings of at least $200. This treadmill will ship in a couple of boxes and takes from 1 to 2 hours to assemble. The ProForm Pro 2000 costs $1,299 USD which includes free shipping. * All prices are in USD unless specified other wise. Prices, coupon codes, products offered, and product features last checked March 24, 2016. ProForm gives a 30-day trial period on all products. If you are not completely satisfied with the Pro 2000 treadmill you can return it within 30 days of delivery. To start the return process you must call Pro-Form customer service. A 10% restocking fee (for non defective machines) and return shipping charges will be deducted from your refund. The Pro-Form Pro 2000 Treadmill has a lifetime frame and motor warranty, a 5 year parts warranty (including electronics), and a 2 year labor warranty. Customer support at Pro-Form is accessible by phone, email, and online chat. There is also an online form that you can fill in about the product and what your problem is. The customer support web portal also contains how to assembly videos (via YouTube) and manuals in pdf format. This is also the place where you register your product for your warranty. I ordered the Pro 2000 on Proform.com. I haven't ordered something this expensive online before but I did get it on sale. 4 members of the family are using this treadmill and so far in the 3 months we have been using it, it has been great. It runs smooth without any noises. It probably sees about 1 or 2 people using it every day for about an hour in total. iFit is also pretty neat and is a must in my opinion for us with so many people using it. It's nice to be able to create your own programs and keep track of the calories you burn. I just wish there wasn't a subscription fee since that was one of the reasons to get a treadmill was to get rid of our gym memberships and fees. Folds at only about 75% angle. Would be better if it folded completely. iFit requires a subscription.